The pet experience without hassles and expense. Perfect for anyone in hospitals and assisted living. Say hello to love and cuddles with the perfect pet! 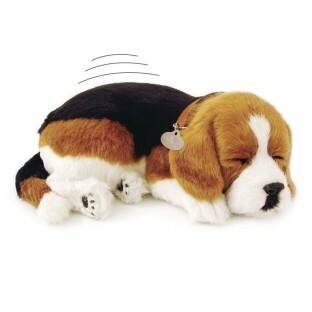 Lifelike puppy actually breathes! This lovable and adorable pet offers a real pet ownership experience without the hassles and expense. Completely comforting and perfect for Alzheimer's patients and those in hospitals and assisted living. Say hello to lots of love and cuddles with the perfect, ultimate pet. Runs continuously up to one month on a single "D" battery (included). Soft and oh-so-real plush synthetic fur pet comes with carrying crate, adoption certificate, collar set, bed and hair brush. This item is activated by pulling a tab that protects the battery (which is included and is also replaceable). Approx. 10" x 7-1/2" x 3-1/2". To clean, use a damp cloth to gently surface wipe/wash. Our Clients Love This Little Dog! We just keep this little pup on his bed on an end table in our day room. Our folks like to stroke his fur or just talk about how cute he is or remark how peaceful. I would have rated it higher but it's difficult to see the breathing especially for seniors with poor eyesight. But I would recommend this little Beagle just on the basis of how much our clients enjoy him. This puppy is amazing! Looks so real and its little chest rises up and down!!! Our residents fell in love with the beagle at first glance. They enjoy petting him - it calms them. Although the dog doesn't bark or move the residents enjoy watching it breath and petting it. It is calming for them.